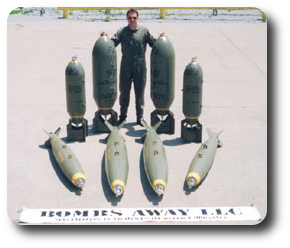 Bombs Away LLC is a small company specializing in lightweight replica bombs, grenades, and military items for museums, aircraft owners and collectors. With a patented process, we are able to reproduce tough, highly detailed, accurate full-scale replicas using high-density rigid polyurethane foam. With an emphasis on detail, Bombs Away LLC’s bomb replicas ‘look’ heavy, while weighing 1/10 the weight of the original. Why restore a million-dollar aircraft or display and NOT have the best replica bombs and accessories to compliment it. 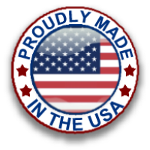 Bombs Away LLC was started back in March of 2000. Owner Matt Hurd throughout the summer would attend airshows both as a spectator and a reenactor, portraying a bomber crewman. Many times while standing near a warbird, he would hear, “what did this plane carry”, or, “how big were the bombs that this plane carried”. 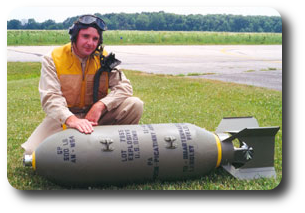 Being a warbird enthusiest and a mold maker, Matt realized a need for highly detailed replica ordnance.